It's been a few months since I've posted anything here, so I figured doing a running diary of Game 1 of the World Series would be a good opportunity to spit out some of my opinions on the last few months and react to some of the culminating moments of the 2013 season. To start, today is the 20th anniversary of Joe Carter's home run, which coincidentally was the last time the Blue Jays were in the playoffs. What interests me more today is that October 23, 1993 was Game 6 of the World Series, while 20 years later that same date hosts Game 1. If this series goes seven games, it will end on October 31. In Boston. The weather starts to get nasty this time of year and what we see on the field no longer reflects the sport that we watch all season. Play gets a little sloppier and players become unrecognizable as they wear massive face masks to shield them from the cold. I'm sure Fox has a lot to say about it, but starting the World Series on a Wednesday after the previous rounds would have finished at the latest on a Sunday is too many off days. Baseball is supposed to be an everyday sport and the additional time off only serves to remind most viewers that hockey has just started, football is in full swing, and basketball is a week away from starting, and these other sports may be more worthy of viewers' attention. The first pitch is scheduled for 8:07 PM. I'll bet on the over. I'm just really hoping this game finishes before midnight. I don't know if these playoff games actually have lasted longer than previous years, but I've definitely found myself more frustrated than ever before. Game 1 of the Boston/Detroit series lasted 3:56 even though the Red Sox managed only one hit. Some of the magic of baseball comes from the lack of a clock, but people want to see action. If relievers plan on taking 90 seconds between each pitch then Fox is going to be very disappointed by the ratings drop off as the innings progress. Want to keep people watching baseball? Don't put them to sleep. Carlos Beltran. His name has been all over the news these playoffs with his Hall of Fame credentials increasing with every clutch RBI. But it seems like we're talking so much about Beltran mostly because there's just no one else to talk about. Both of these teams have won the World Series in the last six years, so we have to look to someone new to create "what can this mean for him" storylines. Beltran has been very good for his career, but too infrequently exceptional. He seems to be one of the nice guys in baseball and he more than deserves this opportunity, but let's not heap too much weight on a few NLDS performances and claim that he's the greatest playoff batter of all time. Yes he's been good, but this is only his fourth trip to the playoffs but his 198 playoff plate appearances are only 2.2% of his regular season total. Can you have too much of a good thing? I'm speaking of course about beards. As a graduate student I fully subscribe to the Church of Beard and facial hair growth seems to be an athletic event in academic circles. But if I have to see one more story about these guys tugging at each other I'm going to lose it. Hockey did it first. "I can't wait to see Clay Buchholz and Joe Kelly bat in Game 3 while one of Ortiz, Napoli, or Salty rides the bench," said no one ever. Top 1, Lester/Carpenter: First pitch, 8:09 PM. Only two minutes late, so that's a promising start I guess. Nice running grab and throw by Drew to retire the first batter. Top 1, Lester/Craig: Aggressive bats so far from the Cardinals. Beltran, Holliday, and Craig have all come out swinging hard. They better hope to get some hits, otherwise Lester going deep followed by an inning or two of the Boston bullpen could be a disaster for the Cardinals. Bottom 1, Wainwright/Ellsbury: Adam Wainwright is 6'7", 230 lbs. But no, anyone can be a professional baseball player if they just want it enough. Ellsbury managed to foul off a big sweeping curve on 2-2 and fought his way to a walk. Ellsbury won that battle, but that pitch looks like it could be dangerous tonight. Bottom 1, Wainwright/Victorino: There's been a lot of talk before the World Series about how Molina will cut down on the Red Sox excellent base stealing. I expected Ellsbury to challenge Molina early, and the big curve on the second pitch seems like it would have been a good opportunity. But one pick-off attempt later and a line drive to LF, we have the same base state and one more out on the board. Bottom 1, Wainwright/Pedroia: Wainwright leaves a cutter hanging and Pedroia pounds it into center field to put runners on first and second. There were a couple big curves though that Ellsbury definitely could have stolen on earlier in the count. Maybe the Red Sox are scared of what Molina can do. Bottom 1, Wainwright/Ortiz: First controversy of the World Series! Just an abysmal call from the second base umpire Dana Demuth. Kozma never caught the ball on the double play flip and dropped it before he even brought his hand to his glove. Shockingly the umpires actually convene and get the call right. You don't usually see that. Matheny comes out to argue the reversed call in an inane activity unique to baseball, yelling to kill time. Pete Kozma better get his act together because if he can't play good defense he has absolutely no value to the Cards. What should have been a routine double play now leaves bases loaded for Napoli. Bottom 1, Wainwright/Napoli: Huge bases clearing double to the gap. Also a bobble by Robinson in the outfield lets Ortiz score on what would have been a much closer play at the plate. Poor defense so far from the Cardinals and Wainwright has hung a couple pitches up in the zone. His curveball has looked dangerous but it hasn't been finding the strike zone and the Red Sox batters are patient enough to wait that pitch out if it's not there. End 1: Wainwright gets out of the inning without any more damage, but the team is in a major hole. It's hard to interpret the first inning. Wainwright left a few pitches up in the zone that were hit, but without the error it's still a 0-0 game right now. It might not matter though. The way Lester has been pitching, a 3 run lead may be enough. Middle 2: Lester pounds the strike zone, and gets two quick strikeouts with his cutter and Matt Adams to hit into the shift. He's at 20 pitches through 2 innings and looking strong. Bottom 2, Wainwright/Drew: Drew pops up, Wainwright calls it, Molina gets a little close, and the ball just drops between them. Could this just be a disaster game where everything that could go wrong will go wrong? Somehow that's ruled an infield single. Sorry about your ERA Adam. Bottom 2, Wainwright/Victorino: Kozma bobbles another ball. It would have been a tough play even if he got it, but that makes three balls this inning now that could have been turned into outs. Somehow this ball is ruled an error while Wainwright's missed popup is a hit. I'm sticking with disaster game. Pedroia up with bases loaded, one out. Bottom 2, Wainwright/Pedroia: Joe Buck informs the viewers that pitchers are allowed to put their hand to their mouth in cold weather to keep it warm. In all other games they are only allowed to run their hands through their greasy hair and rub off-colour spots on their arms. Pedroia works to a full count, further ramping up Wainwright's pitch count, before he gets on top of one of Wainwright's curves and it sneaks under Freese's glove plating another run. Make that four gettable balls this inning that have landed for hits. The curve isn't getting many swing and misses, but it is producing grounders, they're just skipping by the fielders. Bottom 2, Wainwright/Ortiz: Of course right after I jump on Beltran's Hall of Fame case he robs Ortiz of a grand slam. Low wall and Beltran just made that catch look easy, although it results in a sacrifice fly. 5-0 Red Sox. End 2: Wainwright gets an easy grounder that this time no one messes up. The Cardinals luck has been flying around, between missed easy grounders and insane home run grabbing catches. At the end of it all though it's 5-0 and this game might be over before it's really even started (an hour in). Wainwright is up to 60 pitches, so getting even five innings out of him would be an accomplishment at this point. Top 3, Lester/Kozma: Video of Beltran slamming into the wall and then going into the locker room to be checked out. Reminds me of Ben Tate finishing up the Texans game last weekend with four broken ribs. Kozma makes up for his errors by hitting the furthest ball he's ever hit, a light popup to Napoli. Middle 3: Lester strikes out Carpenter to end the inning. 35 pitches through 3 innings and still going strong. 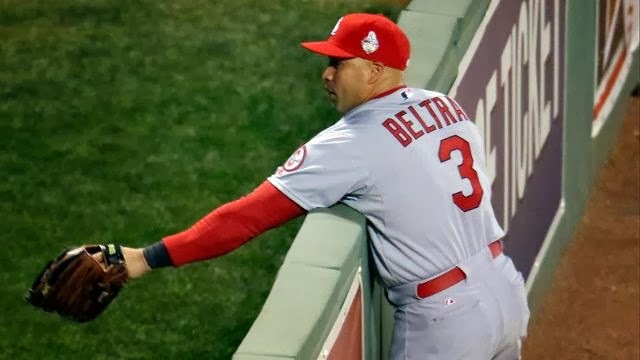 Jon Jay was seen in the warm up circle for Beltran at the end of the inning. He wasn't officially changed yet though and we'll see if the extra time for the inning change gives Matheny a chance to change his mind on the substitution. Bottom 3, Wainwright/Gomes: The substitution is complete and all the fuss about Beltran's first World Series now seems a little more ridiculous. Hopefully he's alright and comes back for the rest of the series. Gomes lightly pops up to first base and Matt Adams doesn't bobble it. Bottom 3, Wainwright/Bogaerts: Kozma catches a ball cleanly! End 3: Drew and Gomes both pulled balls deep and foul, but Wainwright throws an efficient 9 pitch inning without letting anyone on. He's going to need a few more like this, because if the top of the Red Sox order works deep into counts next inning Wainwright won't be long for this game. Top 4, Lester/Jay: Just what the Cardinals want substituted into the game now, a guy batting .220 against lefties facing Jon Lester. Lester walks him on six pitches though and I find myself agreeing with McCarver in that Lester should have just attached him instead of trying to nibble the corners with off-speed pitches. Top 4, Lester/Holliday: Some fun timeout games between Holliday and David Ross prolonging the at bat. None of this would really be necessary it pitch times were actually enforced. Lester gets his fifth strikeout when Holliday swings over an outside pitch. Top 4, Lester/Craig: Craig hits a grounder just out of reach of a diving Stephen Drew. This would be a completely different game if both teams had Andrelton Simmons and Adrian Beltre on the left side of the infield. Only Napoli's double this game has really been solidly hit, the rest have just snuck through or have been errors. Top 4, Lester/Molina: Another seeing eye single that finds its way between Bogaerts and Drew. If the Red Sox aren't in double play depth there definitely would have been a possibility of a play. This has been a weird game. Bases loaded with one out for Freese. Middle 4: Lester gets out of the inning with a weak grounder back to the pitcher from Freese to start a double play. Lester may have given up two hits and a walk that inning, but nothing was hard hit and aside from the extra pitches thrown that inning he can't really have anything to complain about. Bottom 4, Wainwright/Ellsbury: Fox shows a mic'd up John Hirschbeck explaining to Matheny what the umps saw on the first inning Kozma error. Unfortunately they leave out the part I really want to see which is how Matheny responds. I want to hear pointless arguing and what Matheny could possibly be saying to try and get his way. I'm genuinely curious. Two quick strikeouts for Wainwright. End 4: Wainwright gets a big sweeping curve inside for strike two. Victorino responds by taking a 30 second walk around the plate before coming back and having a little chat with Hirschbeck before popping out. One day someone will explain to me why this is tolerated. Get in the batter's box and stay there, especially when you haven't swung or done anything to mess yourself up between pitches. 81 pitches total for Wainwright with the heart of the order coming up next inning. If he gets through that cleanly he could definitely get six innings in. Top 5, Lester/Carpenter: Some more bad defense as Gomes bobbles a ball and lets Robinson and Carpenter both get an extra base. Five runs down with two outs it didn't make a lot of sense to go for the extra base on what turned into a close play, but it worked out here. Middle 5: Drew makes another nice running play to get the Red Sox out of the inning. Up to 78 pitches for Lester, which probably means another two or three innings depending on how the game turns out. Bottom 5, Wainwright/Pedroia: Robinson makes a nice running catch as he pulls up a little scared just short of the wall. I should probably learn who this Robinson guy is since it seems like we might be seeing a lot more of him this series. Bottom 5, Wainwright/Napoli: I think I'm just going to keep picking on Kozma here because I can, but he was a little slow on the transfer on a double play and couldn't get Napoli at first. It certainly wasn't an easy play but I'm sure something that he will think about as he's sitting in the dugout. End 5: Kozma makes a nice play going to his right and throws Napoli out at second making the previous missed play irrelevant except for the one extra pitch to Gomes wearing down Wainwright's arm. Middle 6: 14 pitches, 3 easy outs for Lester. Nothing to see here folks, keep it moving. Bottom 6, Axford/Bogaerts: Well looks like my earlier prediction of five innings for Wainwright was right. He only threw 95 pitches so this move is probably looking to keep his action limited for the future of the series since this game is likely already over. No need to tire out Wainwright for another inning in what is most likely a losing cause. It will be interesting to see if the Cardinals start bringing out their better relievers or their mopup guys. This seems like it could have been a good opportunity to just pitch Shelby Miller for the remaining four innings and save the rest of the bullpen for Game 2. Axford strikes out Bogaerts with some high heat. End 6: Axford does his job and strikes out the side. The Cardinals pitching has looked good all game, even with the early action, but with Lester mowing down the Cards' batters it may all be for naught. Middle 7: Two more strikeouts for Lester brings his total to eight. He's up to 102 pitches, so it seems like he's probably good for one more before handing the ball off to the bullpen to finish it off. Bottom 7, Choate/Ellsbury: With another pitching change I'm guessing we're going to see at least four Cardinals relievers tonight. I see the point of getting some relievers some work after a long layoff, but if Wacha gets knocked out early tomorrow this could be dangerous. Ellsbury grounds out weakly to the left side, and we go to another call to the bullpen for Maness. Bottom 7, Maness/Victorino: Seth "the ground ball machine (TM Joe Buck)" Maness gives up a hard liner to Victorino but a nice jump from Matt Adams gets the out. Bottom 7, Maness/Pedroia: A bad throw from Freese and a bad scoop from Adams puts Pedroia on first. The left side of the Cardinals' infield has been abysmal tonight. This miscue brings in the third pitcher of the inning, Kevin Siegrist. As I said before, it may have just been better to stick in Shelby Miller and let him take his lumps for four innings (late edit: it will only be three innings since the Red Sox won't bat in the ninth if they're winning). Bottom 7, Siegrist/Ortiz: And Ortiz makes the Cardinals pay once again for defensive errors, blasting a huge homerun to right field. Papi takes a curtain call, because why not? Joe Buck says Ortiz is the first lefty to take Siegrist deep all season. Playoff jitters maybe? End 7: With the score up to 7-0, the only real question left now is how many relievers the Cardinals plan on using this game. On a side note, there is no way this Almost Human show that Fox keeps advertising makes it to a second season. Top 8, Lester/Kozma: Lester goes to a full count against Kozma and looks a little slow on the mound before getting a groundout. Returning to the top of the order now I can't see Lester pitching into the ninth and I'm guessing if he gives up a hit this inning his night will be over. Top 8, Tazawa/Jay: Lester gets a huge standing ovation after pitching a solid 7.2 IP, allowing 5 hits, 1 walk, while allowing no runs and striking out 8. Farrell looked like he wanted to save his bullpen by pushing Lester as far as he could, and after 112 pitches and some heavy breathing this inning it looks like he's done it. Not sure if bringing in Tazawa here is the best idea. If I was Farrell I might be looking a little deeper into the bullpen, or even Quentin Berry, to close out what seems like a sure victory. Tazawa does his job though and strikes out Jay on the inside corner. Bottom 8, Martinez/Nava: Carlos Martinez has "electric" stuff. Thanks Buck. Nava comes in to pinch hit for Gomes and knocks Martinez's electric stuff into the LF corner for a double. The Cardinals definitely seem lucky at this point that they won't have to pitch a ninth inning. They're starting to get into the good part of their bullpen. Bottom 8, Martinez/Bogaerts: We're officially at the three hour mark. Martinez throws some more of his electric stuff over Molina's head towards the backstop. Bogaerts hits a line drive sacrifice fly to put the Red Sox up 8-0. McCarver hopes that Bogaerts gets a lower jersey number next year signifying his permanent place on the team. Personally I hope that Bogaerts actually requested his #72 this year and every year, just because this is a stupid thing to talk about. End 8: Martinez throws one up and in on Ross after a late timeout call. Hard to tell whether that was intentional and Molina went out to tell him not to do that in the World Series, or if this was just a part of his wild pattern from this game. Either way the issue probably dies here as Ross flew out to right. Hopefully the Red Sox burn a pitcher they hoped they would never have to use here in the top of the ninth to close out the game. Top 9, Dempster/Holliday: I guess Dempster is a suitable sub, the Shelby Miller of the Red Sox if you will. And by that I mean the fifth starter turned reliever because playoff baseball is a different animal than regular season baseball. Holliday takes Dempster deep. Hopefully Farrell just ignores it and sticks with Dempster since we're going to need seven more of those before it starts to matter. Top 9, Dempster/Freese: Freese almost gets thrown out at first on a hit to RF when he forgets that you are supposed to hustle and run out every ball. End 9: I love it when games end on strikeouts, especially swinging strikeouts. Final Thoughts: The Lester/Wainwright pitching matchup was closer than the final lines made it seem. Lester was an absolute stud, but aside from not being able to get his curveball in for a strike early, Wainwright did an adequate job. The defense behind him (and in front on his own almost-error) was pathetic and the early runs that it resulted in put the game out of reach early. Since the score was never close the game was played in a semi-reasonable amount of time (3:17 officially) as pitchers didn't pace the mound endlessly trying to build up the nerve in high pressure situations. I'm sort of writing this game off on what I think about the series. It was a series of weird plays followed by some late inning garbage when the game was effectively over. The one lingering question is on Beltran's status for the rest of the series. The Cardinals' outfield power is seriously weakened without him and his absence could swing the series.